BIOSWEEP Services is our large loss, national response team that can efficiently mobilize anywhere in North America. Our BIOSWEEP TEAM offers technical expertise and large loss project management resources to provide unique deodorization solutions to insurers, brokers, adjusters, and consultants for claims throughout North America. Each BIOSWEEP TEAM is comprised exclusively of highly experienced and trained BIOSWEEP technicians from within our nationwide BIOSWEEP Service Provider network. Our goal is to reduce your loss expense through reduced tear-out and reconstruction, increased recovery opportunities and better control of ALE and BI due to much faster turnaround. systems generate an oxidative vapor, all buildings must be unoccupied during treatment. 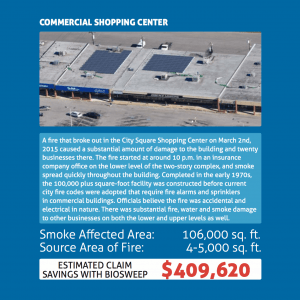 BIOSWEEP institutes a site-specific health and safety plan for all field projects. All BIOSWEEP equipment and deployment of services meet or exceed industry best practices and are regulatory compliant. BIOSWEEP technology uses photocatalytic oxidation (PCO) to break down odoriferous molecules through an advanced process of oxidation. Our systems naturally generate oxy radicals including vaporous hydrogen peroxide, trivalent oxygen and purified oxygen which safely and effectively break down all contaminants that have permeated or are attached to soot or debris on all building materials within the structure. In addition, contents within the structure can be safely treated and generally do not need to be removed prior to BIOSWEEP treatment. Please visit our dedicated site for Insurance Loss Services Information, including case studies and user portal.